Platinum is often used for a 20th anniversary gift. This Diamond Harmony Heart is crafted from solid platinum. Ten diamonds are at the center of this design. 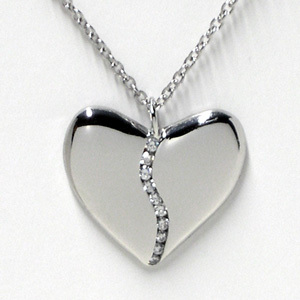 A simple platinum chain is included, discreetly setting off this special heart (1/2" wide). See all our 10th Anniversary Gifts and 20th Anniversary Gifts.